In this magisterial biography, T. J. Stiles paints a portrait of Custer both deeply personal and sweeping in scope, proving how much of Custer’s legacy has been ignored. He demolishes Custer’s historical caricature, revealing a capable yet insecure man, intelligent yet bigoted, passionate yet self-destructive, a romantic individualist at odds with the institution of the military (court-martialed twice in six years) and the new corporate economy, a wartime emancipator who rejected racial equality. Stiles argues that, although Custer was justly noted for his exploits on the western frontier, he also played a central role as both a wide-ranging participant and polarizing public figure in his extraordinary, transformational time—a time of civil war, emancipation, brutality toward Native Americans, and, finally, the Industrial Revolution—even as he became one of its casualties. Intimate, dramatic, and provocative, this biography captures the larger story of the changing nation. It casts surprising new light on one of the best-known figures of American history, a subject of seemingly endless fascination. T. J. STILES is the author of The First Tycoon: The Epic Life of Cornelius Vanderbilt, winner of the Pulitzer Prize for Biography and the National Book Award for Nonfiction, and Jesse James: Last Rebel of the Civil War, which received the Ambassador Book Award and the Peter Seaborg Award for Civil War Scholarship, and was a finalist for the Los Angeles Times Book Prize. 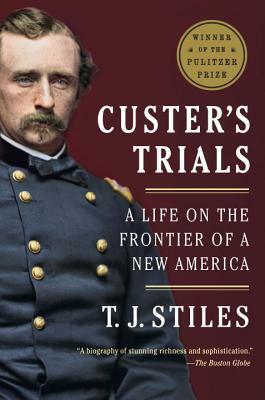 Custer’s Trials was awarded the Pulitzer Prize for History in 2016. An elected member of the Society of American Historians and a member of the board of the Authors Guild, he was a 2011 fellow of the John Simon Guggenheim Memorial Foundation, a 2004 Gilder Lehrman Fellow in American History at the New York Public Library’s Dorothy and Lewis B. Cullman Center for Scholars and Writers, and a member of the 2014 faculty of the World Economic Forum. He lives in San Francisco, California, with his wife and two children.